In the case of a youth arrested in his house and accused of obstructing police (State v. E.J.J. ), the Washington Supreme Court issued an important ruling for free speech rights this week. The Court reaffirmed that individuals have the right to criticize how police are handling a situation and that such criticism cannot be the basis of a criminal conviction for obstruction. “The Court admonished police and lower courts that in the context of the First Amendment, we must be vigilant to distinguish between obstruction and inconvenience. Inconveniencing police cannot, by itself, justify arresting someone for the crime of obstruction,” said ACLU-WA staff attorney La Rond Baker, who co-authored the ACLU amicus brief in the case. “Further, as Justice Gonzalez noted in his concurrence, ‘[W]hile police, no less than anyone else, may resent having obscene words and gestures directed at them, they may not exercise the awesome power at their disposal to punish individuals for conduct that is not merely lawful, but protected by the First Amendment’,” added Baker. The ruling arose from an incident in 2011 when Seattle police responded to a call regarding E.J.J.’s sister, who refused to leave family property. Police encouraged the sister to voluntarily leave the property, and she refused – a situation witnessed by E.J.J., her 17-year-old brother. When E.J.J. observed one of the officers unsheathe his nightstick, he feared for his sister’s safety and began to object sharply to the officers’ response to the situation. E.J.J. reentered his home and from behind a locked metal screen door continued to observe and criticize the officers’ actions on his front lawn. An officer repeatedly told E.J.J. to close the solid wood door behind the screen so he could no longer view the situation. When E.J.J. refused, the officer became irate, came into the house, and arrested E.J.J. for obstruction. 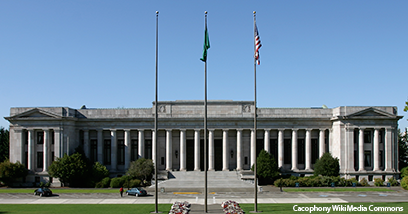 Under Washington State law, a person is guilty of obstruction when they interfere with or delay a police officer from performing their official duties. To be charged with this crime, a person must have engaged in actions beyond just words or expression which are constitutionally protected. In our amicus brief, the ACLU contended that speech directed at police is protected so long as it does not actually interfere with the performance of their duties. And we pointed out that people’s right to observe law enforcement officers in public is an important means of holding police accountable for their actions. In her concurrence, Justice Barbara Madsen agreed with the outcome of the majority’s opinion but arrived there for very different reasons. Citing the ACLU’s amicus brief, Madsen found that the conviction should be reversed because of the racial disproportionalities in convictions for obstruction and the conduct of the police in obstruction cases. Madsen proposed a common law additional requirement in assessing whether an obstruction charge should be upheld: a review of the police officer’s action to ensure that the officer did not escalate the situation triggering the conduct that results in an obstruction charge. Handling the case for the ACLU-WA were cooperating attorneys David Perez and Charles Sipos of Perkins Coie LLP and staff attorneys La Rond Baker and Nancy Talner. Washington Appellate Project attorney Lila Silverstein represented E.J.J.